Home of more than 100 restaurants, the Walt Disney World Resort is certainly not low on options of places to eat while on vacation. With countless varieties of cuisine, themed locations, and price ranges, however, it can be challenging to narrow down the best of the best – especially if you’re traveling with kids. Aside from the popular character dining meals (check out this recent post by Brian McNichols regarding their value) and the standard “chicken fingers and fries” option at a counter service…what’s a family to do? 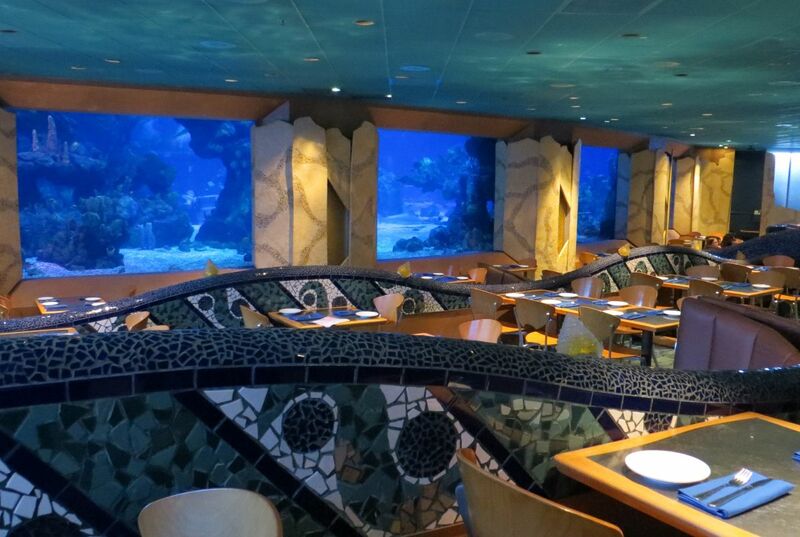 The Coral Reef Restaurant, Epcot. Well, fear not! The following is a top-5 list (along with some honorable mentions) of the best picks for kids dining. I include a variety of both counter and table service options, as well as a spectrum of price ranges and locations (both in and outside of the theme parks). Participation in the Disney Dining Plan and/or Tables in Wonderland or other discounts is noted based on the most recent updates on TouringPlans.com. Although most guests consider the star dining attractions of the park on the World Showcase side of Epcot, The Coral Reef is a lovely retreat from the scorching heat outdoors, and boasts a varied menu that centers around artfully prepared seafood (though other options, including steaks and pasta are available for guests not so inclined). For kids, pizza, grilled chicken breast, roasted pork tenderloin and grilled fish of the day are all options set at $8.99 (plus tax) and include a beverage. While the reviews for food served at The Coral Reef are often mixed, most can agree that the enchantment of seeing fish, turtles and even sharks and divers swim by is something special. Guests are advised that there are three tiers of seating (see image above) for optimal viewing throughout the restaurant, but requests may be made upon arrival at the podium for a closer-up look based on availability. Tables in Wonderland: yes, 20% discount. Disney Dining Plan: 1 credit per person. Alternative pick in Epcot: Teppan Edo (Table Service) – located on the second floor of the Japan pavilion, this dining location features high-flying food antics, fun for kids of all ages. Kids menu options range from $9 to $13.50. 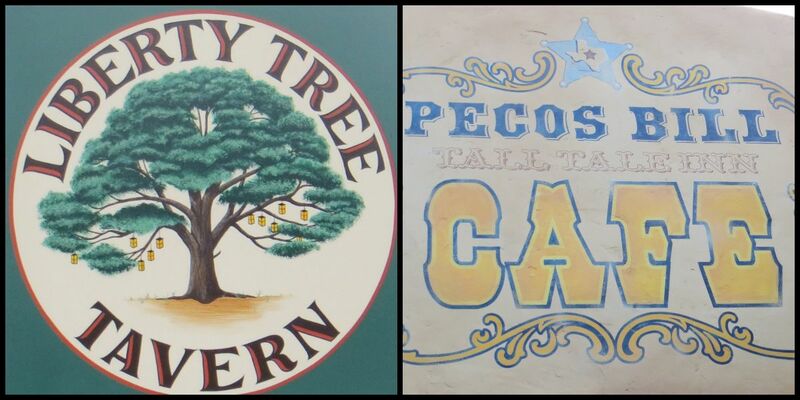 Stepping into the Liberty Tree Tavern is just like stepping back into time. From the colonial artwork, to the creaky floors, it’s easy to forget just where you are when dining here. Kids enjoy a variety of complete options for lunch, including: Roasted Turkey, Macaroni & Cheese, Pasta with Marinara Sauce, Barbecue Chicken and Pineapple Flatbread, served with a beverage and even a desert choice (apples, seasonal fruit or ice cream sundae) for $8.59 (plus tax). At dinnertime, the restaurant converts to an all-you-care-to eat family-style feast, featuring: salad, turkey, carved beef, sliced pork, mashed potatoes, veggies, stuffing, macaroni & cheese plus ‘Johnny Appleseed Cake’ ala mode! This serving format allows for a meal as big as the family has an appetite for, and is great for pickier eaters. Due to its location in Liberty Square, Liberty Tree Tavern is a popular place to dine around parade times – plan your mealtime right and you can walk right out to see the cavalcade come by after your meal! Alternative pick in Magic Kingdom: Pecos Bill’s Tell Tale Inn (Counter Service) – just down the ‘road’ from Liberty Tree Tavern, Pecos Bill’s boasts an incredibly large dining area (making it easy to find somewhere to sit even in the peak parts of the day) and features a tasty fixings bar to customize your burger or taco salad, which includes peppers, pickles, sautéed onions, lettuce, tomatoes, cheese – and even hot melty cheese. Kids picks range from $5.49 to $5.99 and include a peanut butter and jelly sandwich, turkey sandwich, or hamburger. 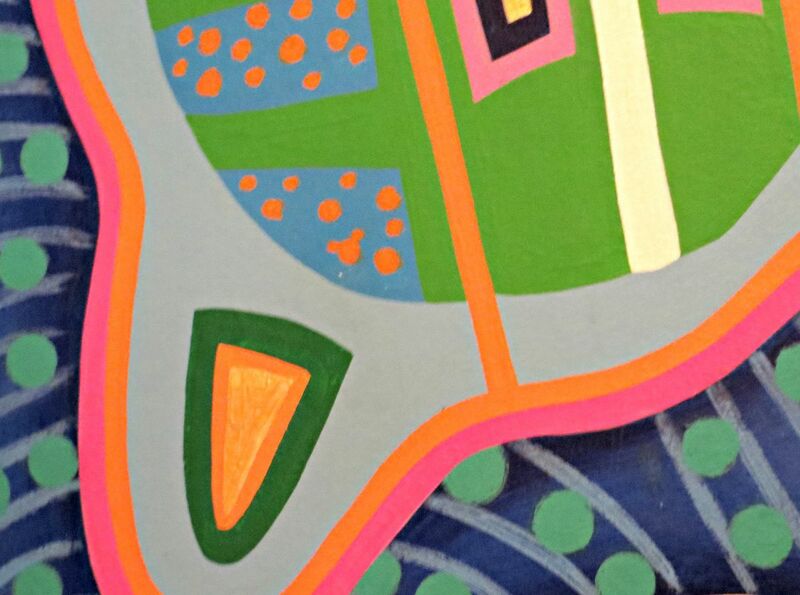 Hidden Mickey on a mural at Pizzafari – do you see it? Although guests with the most discerning of pizza-palates may leave somewhat unimpressed by the cuisine at Pizzafari, the true gem of this location is the attention to detail throughout. When dining at slower times, kids can learn more about each themed room of the restaurant; the Nocturnal Room, Upside Down Room, and Camouflage rooms are just a few of the options! Also worthy of note: this location opens early and offers breakfast platters and french toast for kids, as well as oatmeal, cereal, paninis and fritatta for adults, so if you missed your early meal, you can stop in to charge up for your park day here. Tables in Wonderland: yes, 20% discount. Disney Dining Plan: 1 credit per person (note: since Disney’s Animal Kingdom features a small amount of Table Service Restaurants, most Counter Locations accept TiW – see the website for more complete details). Alternative pick in Disney’s Animal Kingdom: Flame Tree Barbecue – with gazebo seating and tranquil views of Discovery Island and the surrounding areas, this location is both yummy and relaxing. Though it’s outside, kids will love looking for birds and other visiting animals while noshing on finger-licking fare. 50’s Prime Time is highly interactive – all servers welcome you to the restaurant as members of their own family, referring to themselves as “Aunt Lilly,” “Uncle Bob,” or “Grandma Barb,” whilst dolling out proper ettiquette tips (“elbows off the table!”) and serving you at tables with black & white TV’s playing shows from the era. While this can be an incredibly fun experience for more outgoing kids/families, it could be stressful for others – see this past blog post by Kristen Helmstetter for more. Sci-Fi Drive In is over-the-top themed to resemble a drive-in movie theater at night – complete with dining in cars, and servers in rollerskates. The movie screen features clips of vintage horror and sci-fi films, and, true to its theming, the dining area is very dark – factors that could make the experience frightening for very young guests. See this past blog post by Stacey Lantz for more. Kids meals (which include entree, veg/side, beverage and dessert) at 50’s Prime Time are set at $8.59 (plus tax) and include entrees featuring Grilled Fish, Whole Wheat Penne Pasta, Meatloaf, Chicken Nuggets, Grilled Hot Dog, Macaroni & Cheese, and Grilled Chicken Strips. At Sci-Fi, meals are just a tad high priced at $8.99 (plus tax) and options include: Macaroni & Cheese, Cheeseburger, Hot Dog, Chicken Nuggets, Grilled Chicken Breast and Whole Wheat Penne Pasta. One more fun fact that both locations share? Delicious milkshakes! 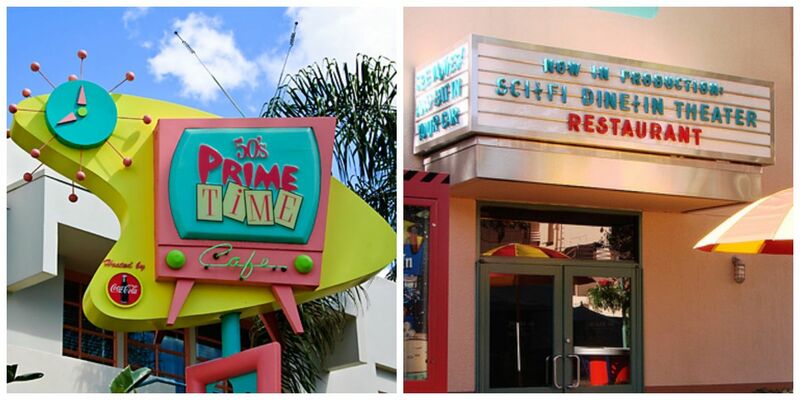 50’s Prime Time has the “you’ve got to try it to believe it” PB&J shake, while parents and other 21+ guests can enjoy adult shakes, complete with glow cubes. Alternative pick in Disney’s Hollywood Studios: Backlot Express – although this location is quite conspicuous, it may sometimes be overlooked due to its placement in the park (Echo Lake area, between the Indiana Jones Stunt Spectacular Show and Star Tours). It made this list for three reasons: a yummy kids menu (“Power Pack” option with Strawberry Yogurt, Carrots, Goldfish Crackers, String Cheese and a Chocolate Chip Cookie, Chicken Nuggets and a Kids Grilled Vegetable Sandwich), options for both outdoor and indoor seating, and tons of space to explore (props, sets, etc). 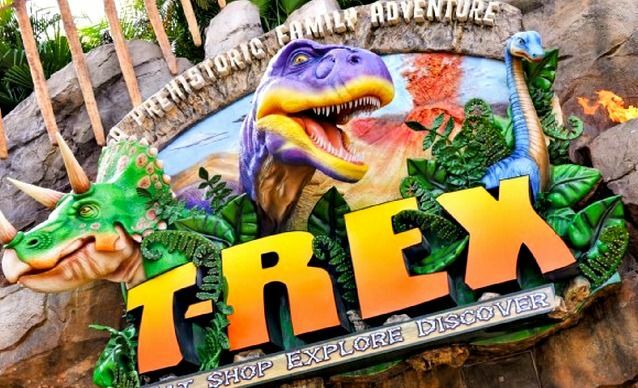 One of two locations in the United States, T-REX Cafe (operated by Landry’s restaurants) serves a true venue for “eat-ertainment” for kids of all ages. Similar in menu / format as its sister restaurant, Rainforest Cafe, its main goal is simple: serve up everything larger than life: from portion size to over-the-top atmosphere! Kids love it because it’s non-stop fun – from the Paleo Zone where kids can dig to their hearts content, to the gift shop with Build-a-Dino toys, and the huge kids menu (all entrees are $7.99 or under) that includes pasta, chicken, burgers, corn dogs, popcorn shrimp and even ribs, the wide appeal will make parents and kids smile. Tables in Wonderland: no. Disney Dining Plan: 1 credit per person, other discounts: DVC /WDW Annual Passholder: 10% discount. Alternative pick in Downtown Disney: Raglan Road Irish Pub & Restaurant (Table Service) – contrary to the belief of many Americans, the pub environment of Raglan Road is not only family-friendly, it’s kid recommended! I read a review written by a 10-year old named Ben on his blog that really blew anything I could ever say out of the water, but in summation: there’s tasty food at reasonable prices ($14 for kids steak, which is the priciest kids’ entree), fantastic entertainment, and excellent service. …so, what did we miss? Do you and your family have your favorite places to eat at Walt Disney World? Let us know in the comments! What’s Up With Walt Disney World’s Rapid Fill Mugs? Our kids really enjoyed the Hoop Dee Doo Revue at Fort Wilderness! I was thrilled that they did. They are 13 and 11 year old boys, so you just never know what the reaction will be. It was expensive, but well worth it to see the big smiles and even out-loud laughing at all the corny cornball humor. We all loved Hoop de Doo too! We have younger boys (6 and 3) and they loved it. We must have had a bad experience or something but all the great reviews at Pecos Bills and we were completely unimpressed. The burgers were pretty gross and the atmosphere wasn’t exciting. For counter service at the Magic Kingdom I would choose Casey’s Corner. The corn dogs are great, you can have cotton candy for dessert (or cracker jacks) and the scenery is great! Only problem is that it was crowded. My kids were so disappointed when we walked up to the Sci-Fi Dine In. That is, until we were escorted to our “car”. Wow! I had scored major points with this one! They are still talking about it. And my husband (a serious sci-fi geek) enjoyed himself just as much. On top of the great theme and atmosphere…the food and the shakes were great too! Score 1 big one for Mom!!!! We did Sci Fi in June. After all the bad press it has received from Unofficial Guide reviews and from other online sources, we were taking a chance. The kids ADORED it! The food was overpriced, for sure! But the kids got french fries and milk shakes — husband and I shared a burger. We thought it was all quite tasty and the experience was just incredibly fun! My post-millenium babies (13 and 11) could not get over the idiocy of the film trailers and public service announcements shown on the big screen. They love, love, loved it!!!!! Great entertainment value! Thanks for the taking the time to share your thoughts! Can’t believe you left off Biergarten! Even as a very picky kid, I could always fill up on frankfurters and pretzel bread while enjoying the great live entertainment. For MK counter service I’d go with Tomorrowland Terrace over Pecos Bill’s–more options including pretty good barbecue, and you get Sonny Eclipse for entertainment. The only exception is if you have a late enough lunch that you can sit outside at Pecos Bill’s and watch the afternoon parade. Thanks for your additions, Brian! Epcot really has too many great places to choose from so it definitely was hard for me to pick just 1-2! It’s great to see a mention of Flame Tree Barbecue on the list. The seating area is so relaxing and a lot different than noisy, cramped places. That’s also the reason that we love Columbia Harbour House, especially the upstairs. It doesn’t feel like a giant cafeteria like Cosmic Ray’s or Pecos Bills. Our kids are pretty young, so keeping them still in those sit-down places at EPCOT would be tough. I like the variety of Sunshine Seasons. They have some food our four-year-old will eat, plus good stuff for adults. It doesn’t have great atmosphere, but it works out okay. Hollywood Studios is where we struggle. We’ve had the best luck at the markets near Tower of Terror. We can just grab a variety of food and sit down outside without having to wait in long lines. Thanks for stopping by with the kind words and suggestions, Dan! I wish more counter-service places carried the Power Pack Box Lunches. We only saw it available at Hollywood Studios (Fairfax Fare?) and they are great for our picky kids who are tired of chicken nuggets and mac & cheese. I believe it came with yogurt, carrots, goldfish crackers, grapes and a cookie and was perfect for our kids – a nice change.